As fascinating as it is, we tend to take our solar system for granted. After all, from our puny human perspective, the local astronomical real estate doesn’t change much. Earth has always been the third planet out from the Sun, and we’ve always had one moon with its silvery phases and predictable tides. The constellations parade across the sky in predictable seasonal fashion. Meteor showers and comets circle at regular intervals. Beyond the occasional supernova, whose light doesn’t even reach us until decades or centuries long after it happens, the changes we observe are minor and unsurprising. But if objects in the solar system, or our galaxy, were arranged just the slightest bit differently, things would be mighty different. Imagine a Hollywood special effects extravaganza right in our own planetary backyard: moons spiraling majestically out of orbit or out-of-control volcanism; dense, cloudy planetary atmospheres that occlude the night sky, to a planetary orbit where half the planet has no day, the other no night. Imagine climates so unstable over thousands of years that evolution never manages to build intelligent life—or somehow produces an intelligence so different that it’s nothing like our idea of human life at all. Fortunately for those whose imagination balks at scenarios like this, Comins gleefully leads the way. 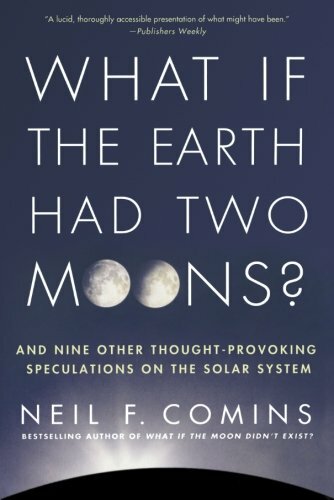 This “what if” is a sequel of sorts to Comins’s 1993 book, What If the Moon Didn’t Exist?, which began as a series of thought-provoking columns in Astronomy magazine. This equally entertaining follow-up delivers ten more astronomical “What if?” scenarios or “makeovers” that re-imagine our tiny piece of the universe. So what if the Earth did have two moons—in this case, one that came about the old-fashioned way (from a glob of matter struck off Earth by an invading comet or asteroid), and a second, smaller orb gravitationally captured later on. Well, for one thing, a moonlit sky would probably be less romantic, since gravity between those moons would drive volcanic activity. Imagine watching the moons erupt regularly! The most spectacular—and catastrophic—view, however would come a few million years in the future when the moons, gradually approaching closer and closer every year, finally collide. A scenario with a backward-orbiting Moon (likewise gravitationally captured) ends in similar disaster, and Earth wouldn’t fare much better if it were a moon of a larger body. Fortunately with millions of years to plan, we’d have plenty of time to prepare for the inevitable. Earth with a thicker crust would not be so hospitable a scenario. An extra thick crust means no tectonic activity, a higher surface temperature (because it’s much harder for heat to escape the molten core), and a dense, humid atmosphere full of sulfur dioxide and other poisons. Worse yet, large sections of the crust would melt through every million years or so, destroying geological features and killing every living thing in the area. And there are plenty more “What ifs” to worry and wonder about: What if the Sun were smaller, or a binary system? What if Earth formed 15 billion years later in the life of the universe, or somewhere else in the galaxy? And worst of all, what if the Milky Way collided with another galaxy, core-born black holes and all? Comins, a professor of physics and astronomy at the University of Maine, writes with clarity and enthusiasm. Each increasingly catastrophic scenario is introduced with a short fictional “alternate history” illustrating how intelligent beings might evolve and live on a world subject to that scenario. Our solar system may not be like any of these (not right now), but there may well be systems that are like them somewhere out there. Comins’s thought-provoking “What ifs” provide a provocative look at just what else might out there, awaiting discovery. Reviewer Charlene Brusso is a science writer as well as an experienced reviewer of both science and science fiction/fantasy titles for a number of book review publications, such as Publisher’s Weekly.